Predictions made in this book — “Back to Basics Reform or OBE Skinnerian International Curriculum” — published in 1985, 1993, and 2004, have come true. The book — which spells out clearly how OBE, Goals 2000, No Child Left Behind, and School-to-Work would be implemented — was boycotted by major conservative organizations. Read it and ask yourself “Why?” The book has sold 50,000 copies to grassroots organizations. 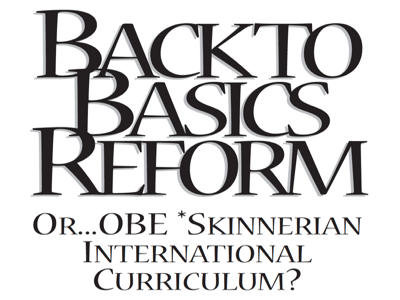 Download the PDF: Back to Basics Reform or OBE Skinnerian International Curriculum?